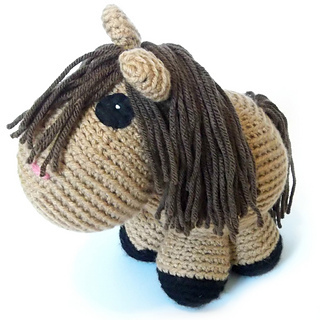 Meet Giddy-up, a sweet little horse ready to gallop off on some amigurumi adventures! Giddy-Up can be made in any yarn and hook combination you want. Just be certain that the fabric is firm enough that stuffing does not show through. My Giddy-Up is made in I Love This Yarn! Solids using three colors and bit of scrap yarn for the nose. Giddy-up is an advanced beginner-level pattern. Skills you will need include single crochet, increases, decreases, color changes, and attaching fringe for hair (instructions included), and some seaming. The pattern has plenty of progress photos to help you along your way to making an adorable little horse Also included is a photo tutorial on how create child-safe eyes from felt, although plastic safety eyes can be used as well.